If you’re looking for a tranquil OBX vacation home, look no further than Indebted By The Sea. 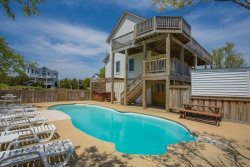 This Kill Devil Hills beach cottage offers peaceful relaxation with contemporary amenities. Just a 3-minute walk to the nearest beach access at E. Arch Street, Indebted By The Sea sits three rows back from the beach and offers amazing ocean views from the back deck. Pull up to Indebted By The Sea and let your worries blow away in the ocean breeze. The fun amenities begin downstairs in the game room. The competition will heat up as you enjoy a game of billiards or play a couple hands of poker at the card table. A full-sized refrigerator and washing machine/dryer is also located on the bottom-level. Step outside through the sliding-glass door to a large fenced in yard and take a dip in the private pool. You’ll also find an enclosed outdoor shower under the house so you can rinse off before you go inside. The main level is open, spacious and beautifully decorated. You can’t help but to feel relaxed thanks to the comfortable seating and delightful décor in the living room. The fully stocked kitchen is open to the rest of the living area so you can still be with your family even when you are cooking! A convenient kitchen island seats three and the nearby dining table seats six people comfortably. Down the hall, you will find 4 cozy bedrooms with the same gorgeous décor. The first three bedrooms have Queen Beds with ceiling fans for comfort and TVs for entertainment. The final Bunk Bedroom is the perfect place for your kids to wind down after a long day of fun in the sun. Two full-bathrooms complete this level. The covered back deck is ideal for sipping your coffee in the morning while watching the sunrise over the ocean or for gazing at the stars in the crystal-clear skies after dark. Indebted By The Sea is in northern Kill Devil Hills meaning you will be within walking distance to restaurants, shops, and other local attractions. Right down the road, Duck Village Outfitters provides local gear and beach rentals from everything to bikes and beach umbrellas to surf boards and kayaks. For family dining, head across the bypass to Henry’s Restaurant. Established in 1989, Henry’s is open year-round and serves breakfast, lunch and dinner, accepts carry-out orders and has daily specials sure to please both the surf or turf lovers! If you dream of reeling in a big catch, Avalon Fishing Pier is located just a mile down the road and is the perfect place for beginners and seasoned fisherman alike. Kids of all ages will love visiting Paradise Fun Park, which is less than a 10-minute walk away, to enjoy bungee trampolines, go-karts, bumper cars, or a round of mini-golf. Whether you prefer to stay in and relax or go out and explore, Indebted By The Sea is the best place to spend your next vacation! New to Seaside for 2019!